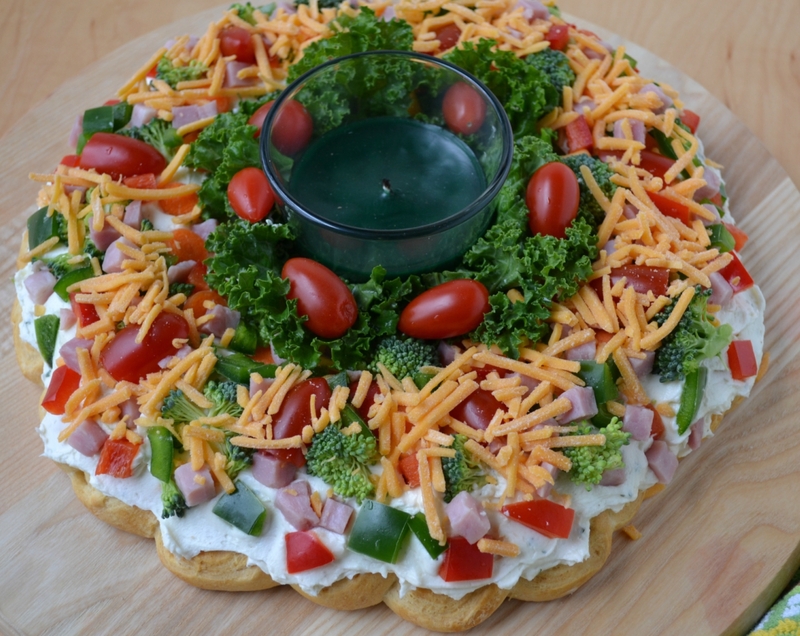 The holiday season is here and that means we need to have several quick and easy appetizer recipes available. 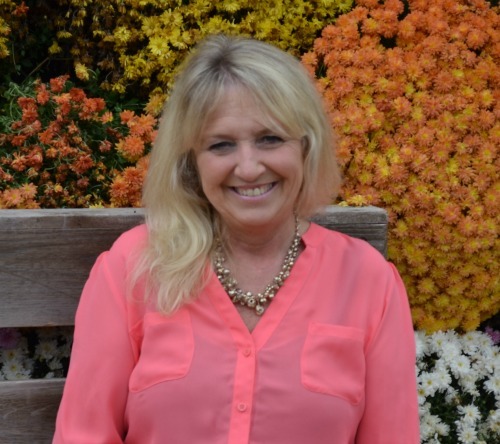 I am always looking on Pinterest, as well as reading many other blogs, for new appetizer ideas. One day I was looking through my older cook-books at appetizer recipes from the 1980’s and around that time frame. We made veggie pizzas and fruit pizzas so many times. This recipe is an festive spin on a veggie pizza. 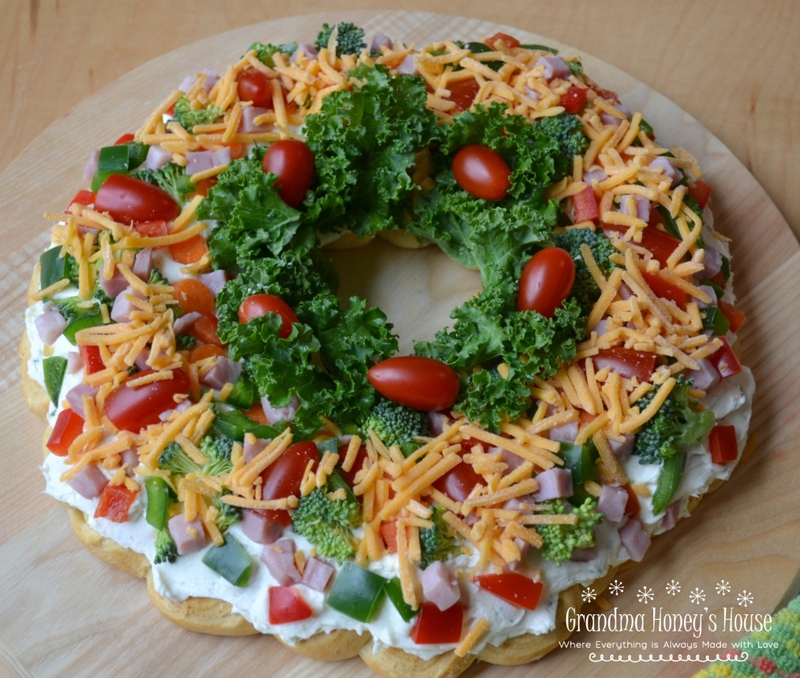 To begin making the wreath, open a can of crescent dough and slice into 16 equal size slices. 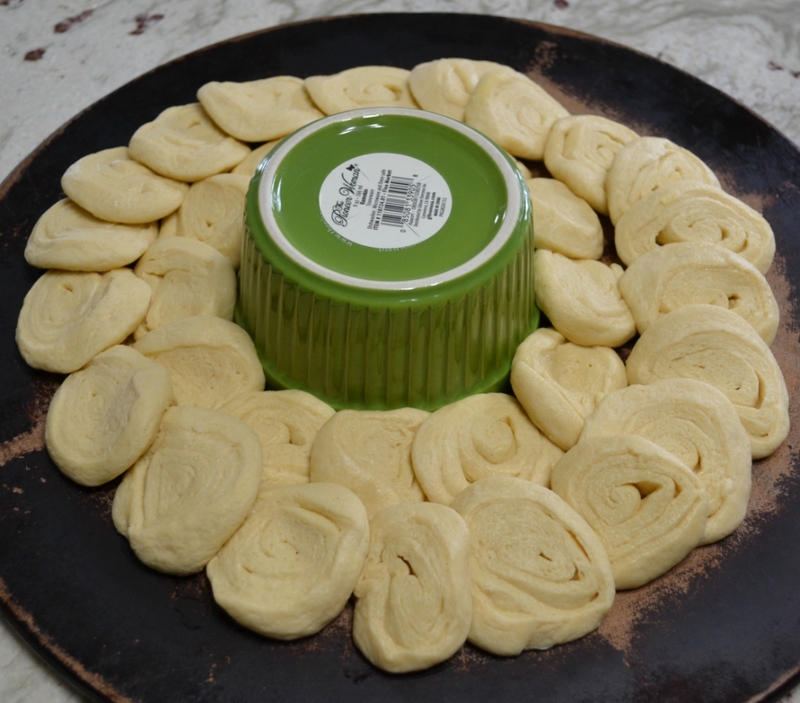 Place a small round ramekin in the center of a round baking pan. I use my pampered chef stoneware. Sorry it looks well used but it is “just well seasoned.” Arrange the first layer of dough around the dish in a clockwise pattern, with edges slightly overlapped. Use 12 of the slices. Next, open and slice the second can of crescent dough into 16 slices. Arrange the 20 slices in a clockwise patter around the first ring. Edges should be slightly overlapped. If the second ring of dough is overlapped too much the pizza crust will be too thick. Remove the ramekin. Bake until crust is light golden brown. Remove from oven to a cooling rack for 20 minutes. Run a long sharp knife under the bottom of crust and slide carefully onto a wire cooling rack. Transfer cooled crust to a serving platter. Prepare the filling and toppings while the crust is baking and cooling. Spread cream cheese filling over the crust. Top with ham, veggies, and cheese. Press down slightly. Refrigerate until ready to serve. 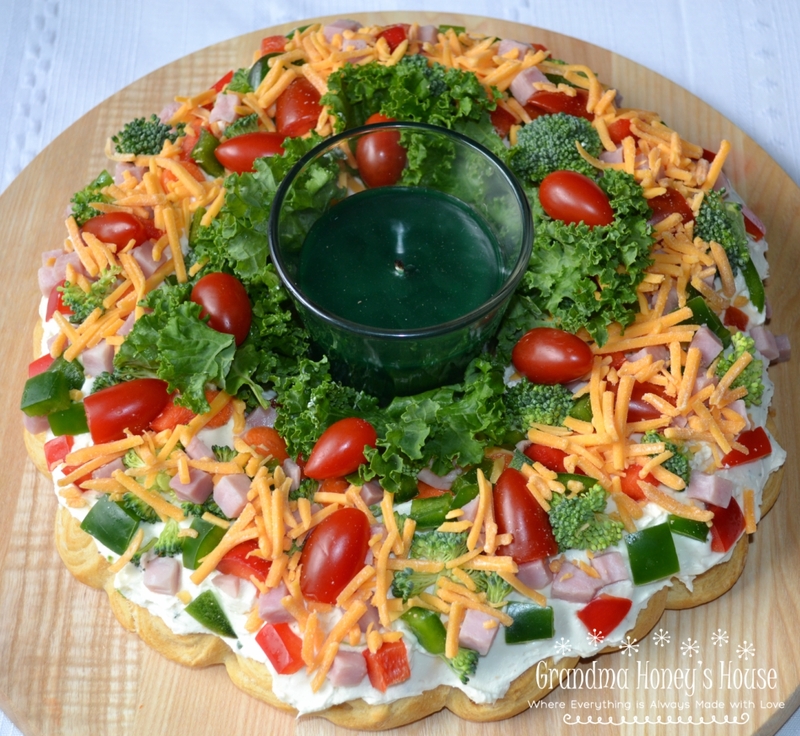 To make a festive presentation, add a candle in the center surrounded by greenery such as parsley. Do not use a scented candle, as it will give the food a flavor. An LED candle would be perfect. Slice into desired size pieces to serve. Preheat oven to 350 degrees F. Line a baking sheet with parchment paper, or use a baking stone. Place a small, round bowl such as a ramekin in the center of pan. 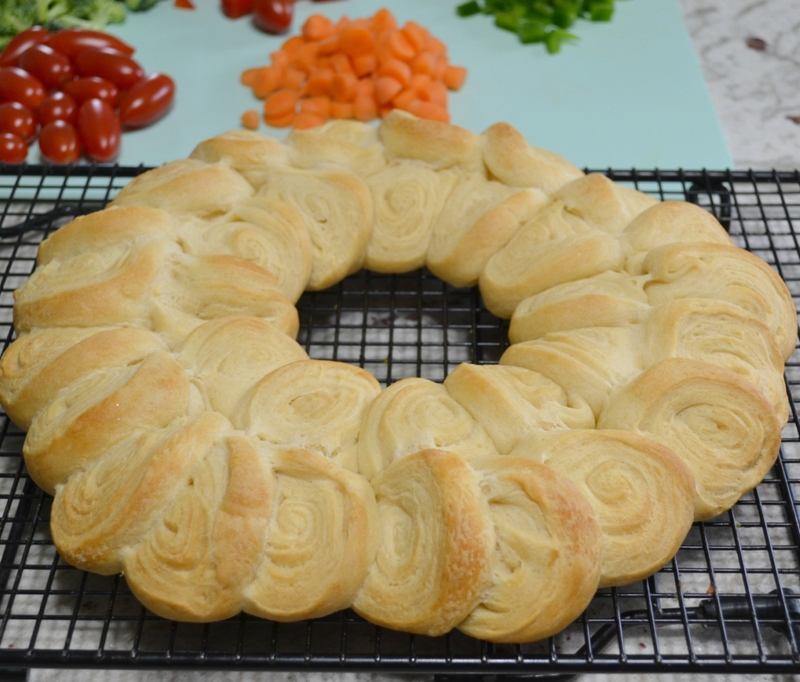 Open one can of crescent dough and do not unroll. Roll carefully into a 12 inch log. Cut into 16 equal slices. 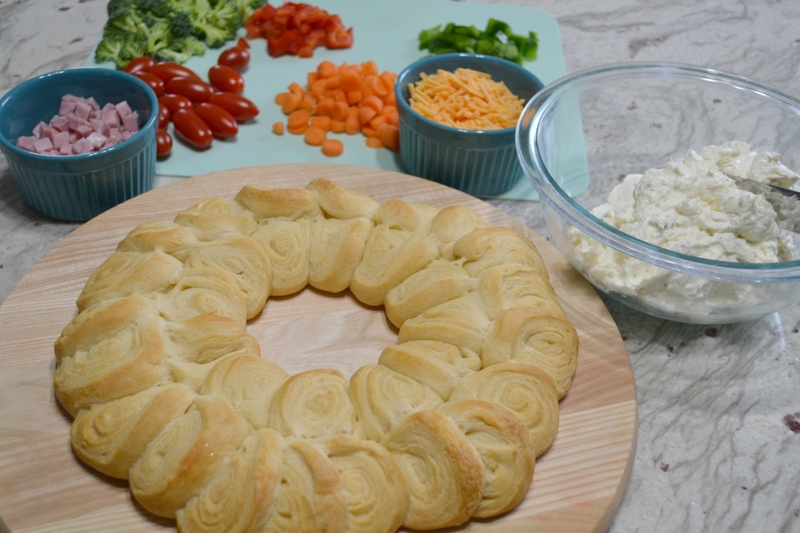 Make a ring around the bowl, in a wreath pattern, slightly overlapping the edges. Use 12 slices. Open the second can and repeat procedure. Create a ring around the first one, using 20 slices of dough. Arrange these slices in a counterclockwise pattern. Slightly overlap edges. (If the slices overlap too much, the crust will be too thick). Remove the small bowl. Bake crust about 18 minutes, or until crust is light golden brown. Remove pan from oven to a cooling rack. Cool about 20 minutes, then carefully slide the crust onto a wire cooling rack. While the crust is baking and cooling, prepare the filling and toppings. In a medium size bowl, using an electric mixer, combine the cream cheeses, mayonnaise, and ranch packet. Mix until smooth and well combined; set aside. Clean and chop the veggies. You may use any combination that your family prefers. 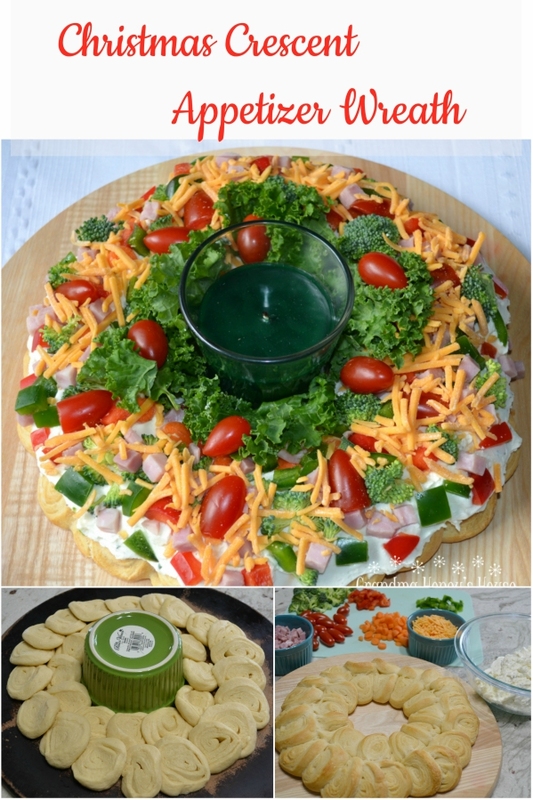 Place cooled crust on a serving platter. Spread the filling evenly over the crust. You may not use it all. 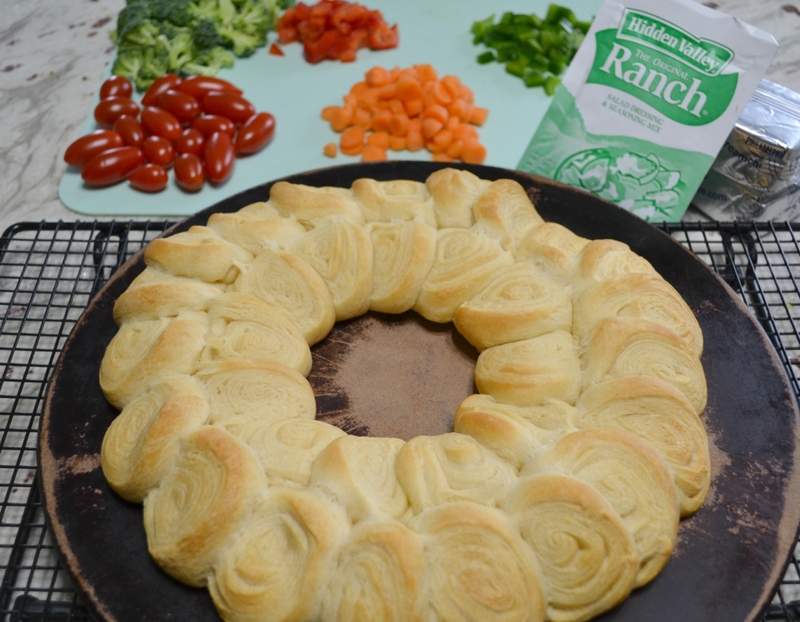 If your dough rings were arranged with only edges touching, you will have a larger wreath. If the dough slices were overlapping too much, the wreath will be smaller. Top evenly with the veggies, ham, and cheese. 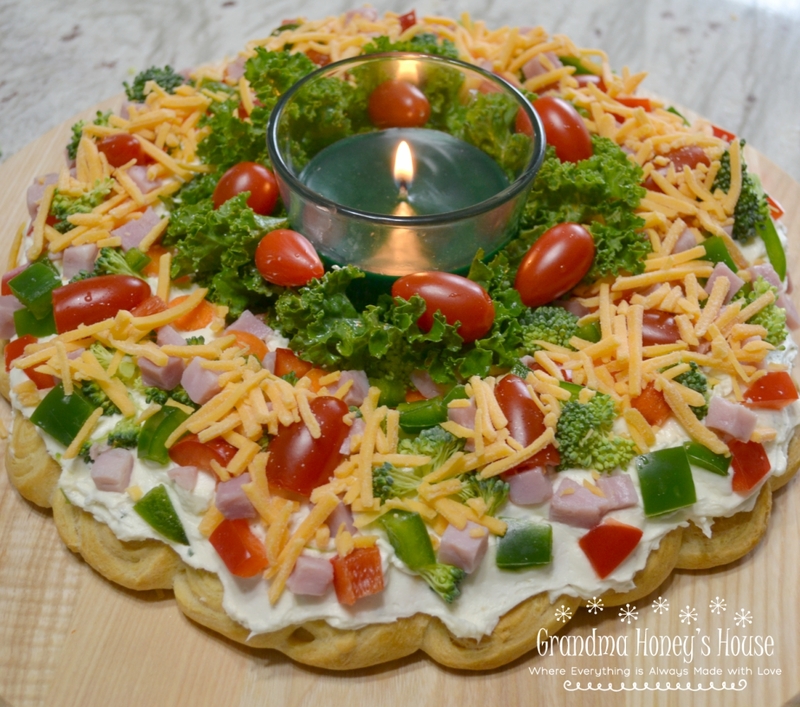 Cut some of the tomatoes in half and place around wreath. Press toppings down slightly with hands. If desired, arrange kale or parsley around the center ring and add a candle or other Christmas decoration the fits in this space. Refrigerate until ready to serve. Tastes great at room temperature. Cut into desired size slices. Can be made 1 day ahead.